I really hate poor arguments. I seem them all over the place. the worst is the way people pick up these arguments and they just multiply across the world. I guess that is really a meme is. There are lots of arguments about the Baseball Hall of Fame and the statues of players who are known to or believed to use performance enhancing drugs. There is a spectrum of ideas here, going from all that matters are the numbers to keep everyone out who even might have used anything. There are a whole bunch of arguments for all the different point on the spectrum. My least favorite argument is "The Baseball Hall of Fame is a museum and you can't white wash history." There is a huge problem with this argument, but it is also a simple problem. 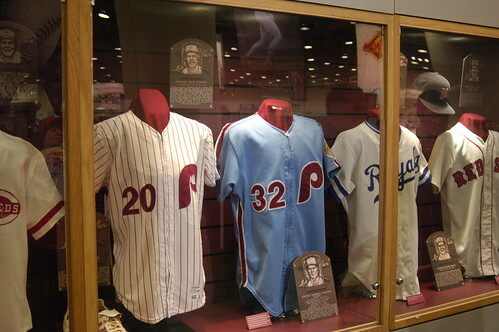 Saying The Baseball Hall of Fame is a museum implies that the members of the Hall of Fame are the only people displayed in the museum. It is like if if you are not inducted into the Hall of Fame, your history will be forgotten. This cannot be further from the truth. When ever there is a record breaking performance people send some of there gear to the Hall of Fame. There are plenty of players who broke single game records but are not Hall of Famers. Mark Whiten is not a Hall of Famer, but the helmet from his 12 RBI game is there. Sports Halls of Fame are odd places. What does it mean to be inducted into a Hall of Fame? I am not sure this is an easy thing to describe. I think a simple argument does not do anything to get to the bottom of this question. It is just a way to dismiss other arguments without addressing them.